Get outdoors at Kamaole Beach Park II and Kapalua Beach. Step off the beaten path and head to Kamaole Beach Park III and Scuba & Snorkeling. 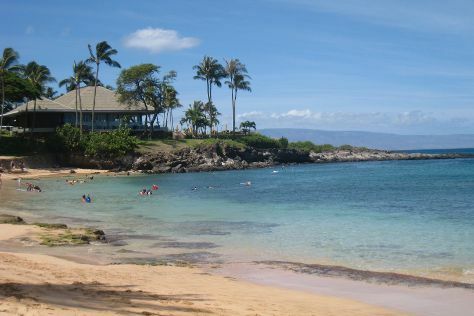 Venture out of the city with trips to Lahaina (Napili Beach & Lahaina Jodo Mission). The adventure continues: kick your exploration up a notch at some of the top local zipline courses and adventure parks, kick back and relax at Makena Beach, stroll through Ho'okipa Beach Park, and sample the tasty concoctions at Maui Brewing Company. Take the guesswork out of planning a Kihei vacation by using our trip itinerary maker. Chicago to Kihei is an approximately 11-hour flight. Traveling from Chicago to Kihei, you'll gain 4 hours due to the time zone difference. In May, Kihei is somewhat warmer than Chicago - with highs of 86°F and lows of 68°F. Cap off your sightseeing on the 22nd (Wed) early enough to travel to Volcano. On the 23rd (Thu), explore the striking landscape at Thurston Lava Tube (Nahuku), hike along Kilauea Iki Trailhead, then get impressive views of Kīlauea, and finally see the interesting displays at Jagger Museum. To find more things to do, other places to visit, traveler tips, and more tourist information, read our Volcano road trip planner. Getting from Kihei to Volcano by flight takes about 4.5 hours. Other options: do a combination of flight and bus. May in Volcano sees daily highs of 82°F and lows of 67°F at night. Finish up your sightseeing early on the 23rd (Thu) so you can travel to Hanalei. Hanalei is a census-designated place (CDP) in Kauai County, Hawaii, United States. Visit Tunnels Beach and Anini Beach for some beach relaxation. You'll explore the less-touristy side of things at Hanalei Beach and Kalalau Trail. There's much more to do: admire the majestic nature at Na Pali Coast State Park, take a memorable drive along Hanalei Valley Lookout, look for all kinds of wild species at Hanalei National Wildlife Refuge, and explore the striking landscape at Queen's Bath. Quickly create a custom-made itinerary for Hanalei using our trip planner. Traveling by flight from Volcano to Hanalei takes 5.5 hours. Alternatively, you can do a combination of bus and flight. In May, daily temperatures in Hanalei can reach 82°F, while at night they dip to 71°F. Wrap up your sightseeing on the 26th (Sun) early enough to travel to Honolulu. We've included these beaches for you: Kailua Beach Park and Lanikai Beach. Visiting Kayaking & Canoeing and Swim with Dolphins will get you outdoors. Go for a jaunt from Honolulu to Kaneohe to see Byodo-In Temple about 32 minutes away. There's lots more to do: stroll the grounds of National Memorial Cemetery of the Pacific, examine the collection at Bishop Museum, take in the spiritual surroundings of Saint Andrew's Cathedral, and take in the architecture and atmosphere at The Church of Jesus Christ of Latter-day Saints. For photos, other places to visit, where to stay, and tourist information, you can read our Honolulu road trip app . Traveling by combination of taxi and flight from Hanalei to Honolulu takes 3 hours. Expect a daytime high around 84°F in May, and nighttime lows around 71°F. Finish up your sightseeing early on the 30th (Thu) so you can travel back home.